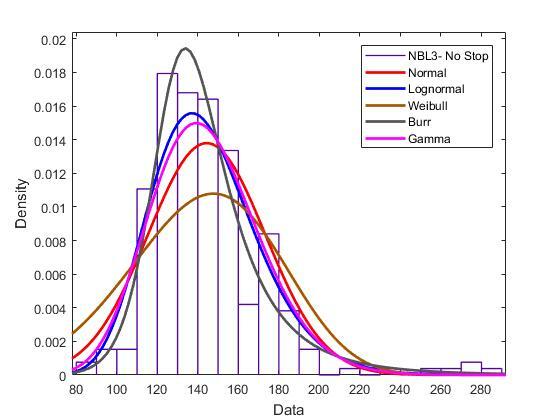 i have a set of data, say data = [1000 random data points] and i want to fit more than once distribution to it (normal, lognormal, weibull, burr, gamma), now I want to use the AIC test to see which model fits the data the best (of course given that all models are significant). what i do is, i use the "Distribution Fitter" Tool from APPS and plot the data along with the distributions as seen in thie pic. now I want to know which one fits the best using AIC. what I do, I save each distribution to the work space. say the names are of the models are: a,b,c,d and e.
but it is not working. it also does not make sense because the original data is not included in this code so that it is the reference to the test.